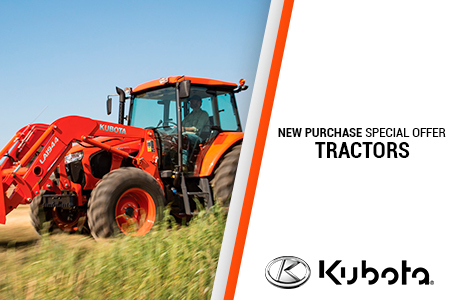 Meet your new favorite piece of equipment: Kubota's Standard L Series takes power and performance to new heights. With a valuable combination of horsepower and high-quality construction, this feature-packed compact tractor is perfect for small property owners – starting with how much you’ll look forward to using it every day. Performance Matched Backhoe: Kubota Built Backhoe – Kubota’s backhoes are built by Kubota and specifically designed to maximize the performance of the backhoe and tractor; Easy To Remove – The Kubota BH77 and BH92 are easily removed without the use of tools; Ease of Use – Designed with plenty of dig depth and reach, smooth hydraulics, cushioning valves to prevent shock when the dipper reaches the end of the cylinder stroke and ample room for the operator, you will find the BH77 and BH92 are not only easy to use, but a pleasure to work with. Easy to Operate- Proven to Work: Operator Comfort – Comfort is key, and Kubota has it with an open working station, comfortable seat, ergonomic control layout and the Kubota Treadle Pedal (HST models only); 3-Range HST – Kubota L01 HST models have a 3-range transmission, making it easier for any operator to find the right mix of speed and torque, no matter the job; Simple and Easy to Use PTO – Kubota offers PTO clutch systems with simple designs that are easy to use. Built to Last– Quality, Durability, and Longevity: Kubota Diesel Engine – Kubota is the #1 manufacturer in the world for under 100 HP non-automotive, multi-cylinder diesel engines; Heavy Duty Construction – From the heavy duty front axle to the cast steel transmission and rear end, all the way to the steel hood and fenders, the Kubota is built to last; Kubota Designed, Kubota Built – Front to rear, the Kubota tractor is designed and built by Kubota for our Kubota customers. You won’t find a “Kubota” re-branded tractor built by others, only Kubota quality through and through; Helical Cut Gears – Helical cut gears in the rear housing mean a quieter ride and stronger gear set when compared to the spur gears some of our competition uses; Kubota Reputation For Quality – Kubota is known for our quality, reliability and longevity – you can’t fake a good reputation, it can only be awarded to you by your satisfied customers. Performance Matched Front End Loader: Kubota Built Front Loader – Kubota’s front loaders are built by Kubota and specifically designed to maximize the performance of the front loader and tractor; Easy To Remove – The Kubota LA525 and LA765 Front Loaders are designed to be easy to remove and re-install, without tools, whenever the job demands it; Ease of Use – With plenty of lift capacity, simultaneous lift and curl functions, optional bucket level indicator rod and 2 lever quick coupler, the Kubota LA525 and LA765 Front Loaders make it easy to complete your task with speed and ease. Multiple Models to Fit Your Needs: Kubota understands that not every customer’s needs are the same. 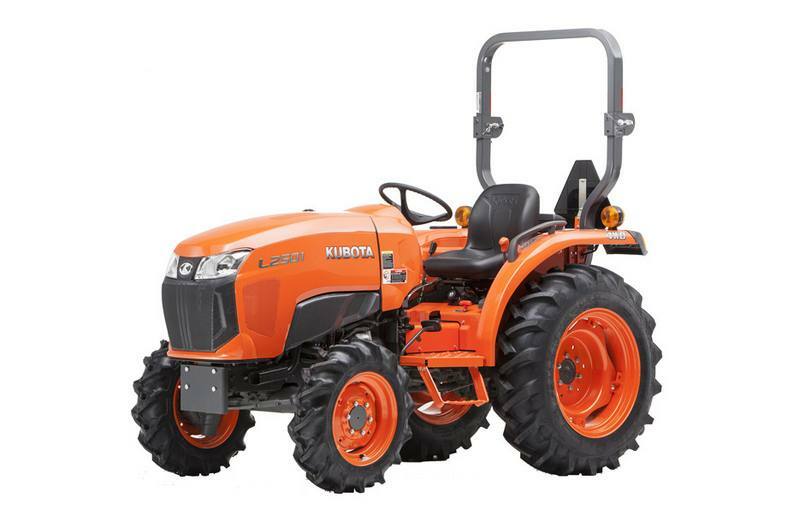 With that in mind, Kubota offers multiple options for customers throughout the L01 Series lineup. Options: Efficient Gear Drive or Easy To Use Hydrostatic (HST) Transmissions – Whether it is more power to the ground, or simplicity and ease of use, Kubota has a transmission to suit your needs; 2 or 4 Wheel Drive Front Axles – Not everyone needs or wants a 4WD tractor, Kubota offers you the choice; Multiple Tire Options – Available with Ag, Turf, or Industrial tires, Kubota can equip your tractor to suit your conditions; Adjustable Wheel Spacing on Standard Tires – Adjust the wheel spacing to your specific needs with our Ag tires on adjustable rims; Front End Loader Options – Performance matched front end loaders to help you get the job done; Backhoe Options – Performance matched backhoes allow you to tackle digging chores without spending the extra money to upgrade to a “premium” tractor. Ready for a Long Day of Work: Suspension Seat – Our contoured suspension seat reduces fatigue and offers all day comfort; Easy to Use Control Layout – Ergonomic controls increase both operator comfort and safety; Easy to Read Dash Panel – Features large gauges showing RPM, engine temperature and fuel level; Larger Operator Platform – There’s plenty of foot room on our spacious operator’s platform; HST Treadle Pedal – HST models come with the Kubota Treadle Pedal, which is easy to use with no confusion on which pedal you are pushing, making every job faster and safer; Convenience – Standard cup holder, tool box and large fuel tank capacity; Foldable ROPS – ROPS for maximum protection, foldable for maximum convenience. The company reserves the right to change the above specifications without notice. This brochure is for descriptive purposes only. Please contact your local Kubota dealer for warranty information. For your safety, Kubota strongly recommends the use of a Rollover Protective Structure (ROPS) and seat belt in almost all applications. For complete operational information, the operator’s manual should be consulted.